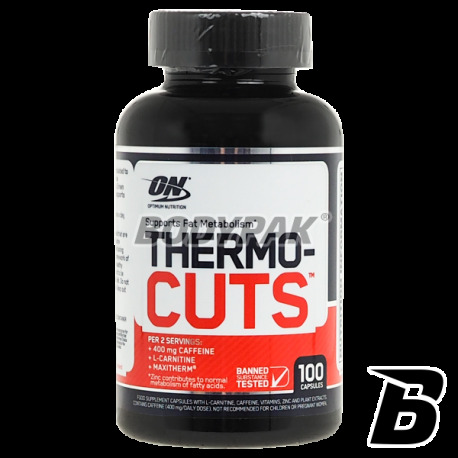 Fat LossOptimum Nutrition Thermo Cuts - 100 kaps. 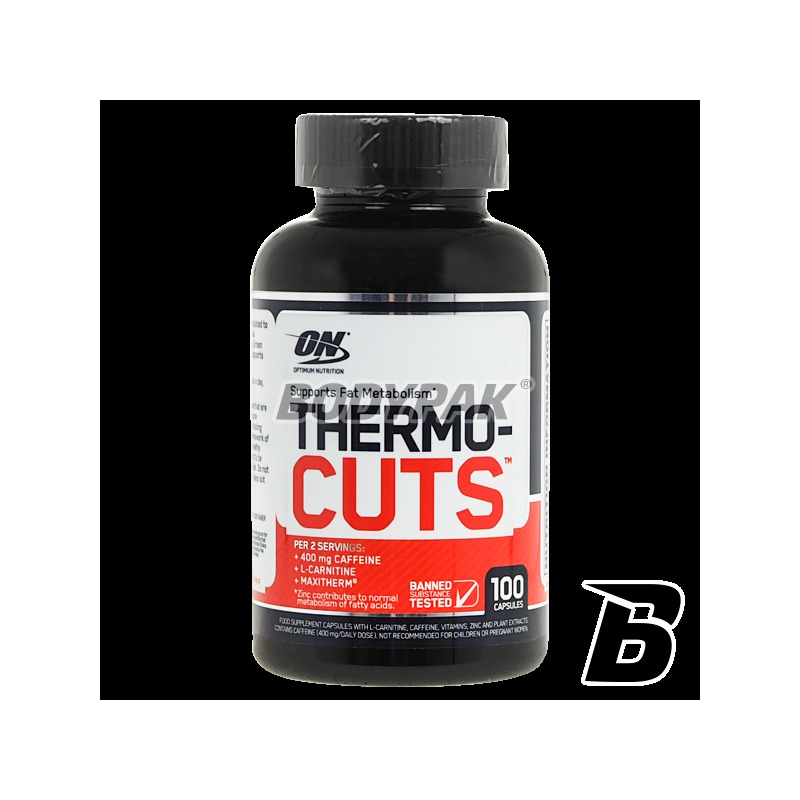 Optimum Nutrition Thermo Cuts - 100 kaps. Thermo Cuts of high quality supplement comprising a mixture of herbs with chromium and L-carnitine, which can effectively reduce body weight and body fat. Optimum Thermo Cuts of high quality supplement comprising a mixture of herbs with chromium and L-carnitine, which can effectively reduce body weight and body fat. Dietary supplement slimming Optimum Thermo Cuts optimal utilization of fat reserves for the purpose of achieving high definition and separation of muscle. If you train with a load, the crowning moment of your fat burning will actually falls after a workout, if you are doing aerobic exercise of low or medium intensity, the best moment of fat burning takes place mainly during exercise and immediately after them. Remember that the greater the intensity of your workout, the smaller the percentage of the amount of fat burned. Therefore exercises of low and medium intensity, lasting for at least 30-40 minutes were traditionally recommended as the best way to maximum fat burning. Ingredients: Acetyowana form L-carnitine HCl, Murray Koenig (leaf extract), a gelatin capsule, caffeine, green tea (Camellia sinensis leaf), the filler (microcrystalline cellulose), an extract of guarana (Paullinia cupana seeds) extract peppers Cayenne (Capsicum annuum fruit) - as MaxiTherm extract, wakame (Undaria pinnatifida, leaf), anti-caking agent (silicon dioxide, magnesium salts of fatty acids), zinc citrate, the extract of black pepper (Piper nigrum fruit) pyridoxine hydrochloride, thiamine hydrochloride, riboflavin. Spalacz sam w sobie działa całkiem ok ale nie pobudza. Ma bardzo ostry skład i ból brzucha i bieganie na kibel niestety nie uniknione. Sporo składników aktywnych sprawia, że ten produkt działa na mnie bardzo dobrze - mniejszy apetyt, przyspieszony metabolizm co jest zdecydowanie odczuwalne. No i waga leci w dół!! Hi Tec HCA Professional - 100 kaps. High-end supplement based HCA (hydroxycitric acid), which reduces the process of formation of fatty acids. Highest quality and safety! Bet on certain product! Fat burner, which was created specifically can women. Effectively supports the fight against superfluous adipose tissue without causing a yo-yo! It includes, among others, components such as SINETROL, caffeine, carnitine, vitamins, minerals, and plant extracts of high quality! Trec L-Carnitine + Green Tea - 180 kaps. Advanced combination of L-carnitine and green tea extract whose activity is visible during weight loss (accelerated metabolism, faster cleansing of the body). Product type softgel LIQUID. Only effective substances causing yo-yo effect! A comprehensive preparation supporting healthy fat loss. It contains no stimulants! The formula is based on proven and effective substances such as chitosan, chromium, zinc, iodine and natural plant extracts.